King's Lynn, originally known as `Lin', is thought to have derived its name from the Celtic word for a lake or pool. It is recorded that a large tidal lake originally covered this area. In 1101 Bishop Herbert de Losinga of Thetford began the first medieval town between the Purfleet River and Millfleet River, by building St Margaret's Church and authorising a market. England’s Hanseatic town of King’s Lynn, is full of fine old merchant houses, courtyards and lanes stretching down to the river. 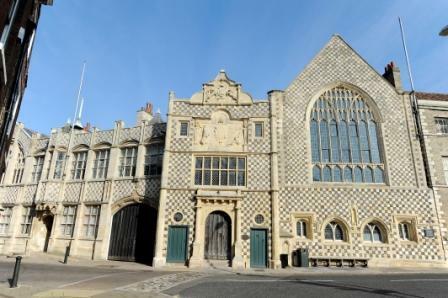 The first medieval market place is dominated by the splendid King’s Lynn Minster and the beautiful Trinity Guildhall. 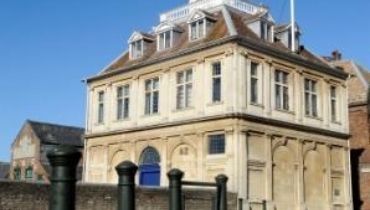 Nearby, the elegant Custom House and visitor centre overlook the medieval harbour and quayside. Combining the wealth of history with excellent theatre, arts centres and shopping, the town is also popular because of the beautiful surrounding countryside and stunning coastline nearby. Quite quickly a small prosperous town grew up and in 1204, following a charter from Bishop John de Grey of Norwich; the town became Bishop's Lynn (Lenne Episcopi). Trade built up along the waterways that stretched inland from Lynn, and the town expanded and quickly filled the space between the two rivers, Millfleet to the south and Purfleet to the north. 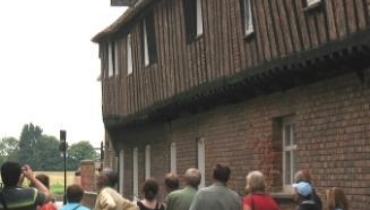 By the late 12th century, a further period of expansion began, more deliberately planned than the first, with wider straighter streets and a much larger market place - this is the second Medieval town between the Purfleet and Gaywood River or Fisher Fleet. Bishop's Lynn grew rich on trade both within Britain and overseas. The legacy of trade can be found in the many merchant houses and other fascinating buildings in this medieval port. After the dissolution of the monasteries by Henry VIII, Lynn changed its name to Lynn Regis - subsequently King's Lynn. In the 13th century, Kings Lynn was the third most important port in England and part of the Hanseatic league. 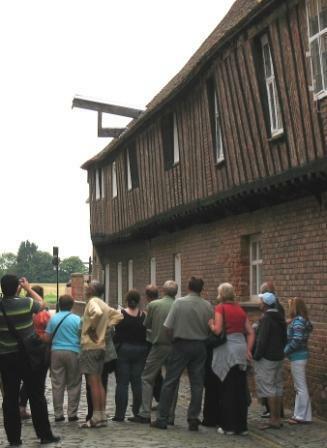 Today, the town is still an active port and retains the last remaining Hanseatic warehouse in England. The town's past wealth and development is closely associated with maritime trading links. 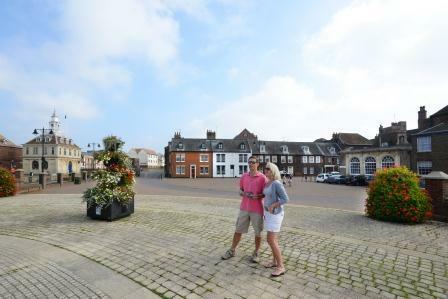 The South Quay area of King's Lynn bears testament to the rich merchants who gave the town so many of the impressive buildings which can still be seen today. A famous landmark and monument to the towns maritime prosperity, is the splendid Custom House. 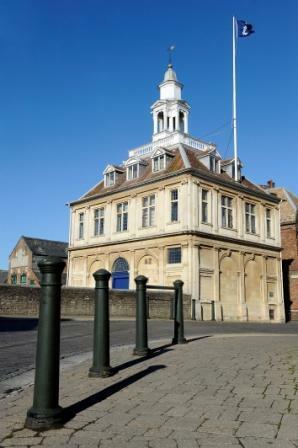 Built by Henry Bell in 1683, it is open to the public as the town's Tourist Information Centre with a special display of the maritime history of King's Lynn. Close to the Custom House, a statue commemorates one of Kings Lynns famous sons, Captain George Vancouver, famous explorer and navigator who was born in 1757. 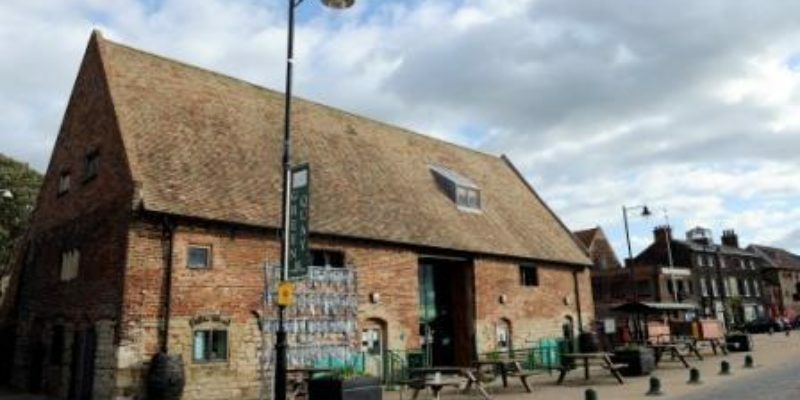 A short stroll along the South Quay is the 16th century Marriotts Warehouse which contains displays on how the town developed or was built and rebuilt over 900 years. There is renewed emphasis on the waterfront with the installation of visitor pontoons. The pontoons are easily accessible to sea-going craft but can also be accessed by craft form the inland waterway network. One of the best ways to appreciate the historic waterfront is to take the passenger ferry across the River Great Ouse to West Lynn. The view back across the river captures the maritime heritage of the town. 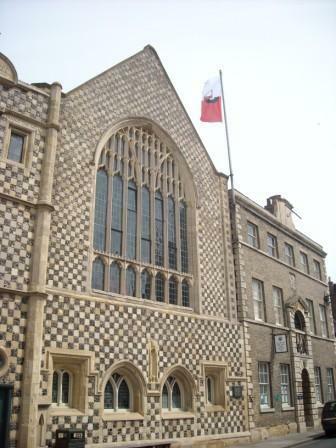 A further tribute to the towns trading history are two magnificent Guildhalls, the chequered-fronted Trinity Guildhall, home to the towns splendid regalia and historic King John Cup and St Georges Guildhall now a thriving Arts centre. 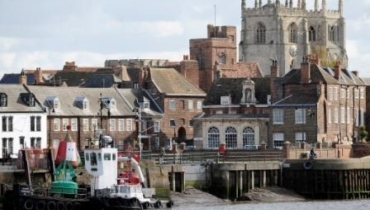 In addition to the magnificent buildings King's Lynn has an impressive range of visitor attractions which tell the town's fascinating and often colourful past. The Lynn Museum, Trues Yard Fisherfolk Museum and Tales of the Old Gaol House all tell parts of the towns history. Another special landmark is Greyfriars Tower, a fine example of a Franciscan Tower which has recently benefited from an extensive restoration programme. Kings Lynn is fortunate to have two magnificent market places. The larger Tuesday Market Place is also home to the King's Lynn Mart. The rights to hold the fair, which takes place each February, were originally granted by Henry VIII back in 1537. In July each year the market place also hosts one of Europes biggest free festivals - Festival Too. This is followed by the renowned King's Lynn Festival which takes place at numerous venues throughout the town. 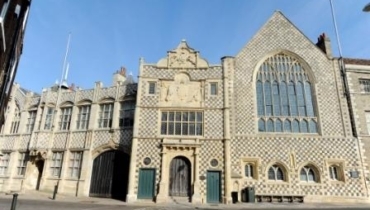 With two main venues The Corn Exchange in Tuesday Market Place and nearby King's Lynn Arts Centre, the town offers a fantastic programme of theatre, music, dance and comedy throughout the year. 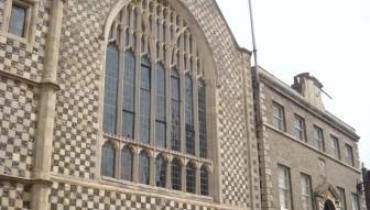 In addition to its rich history, Kings Lynn has a diverse economy. The town has a strong manufacturing base. Originally built around agriculture and food processing, it has long since diversified into precision and advanced engineering, specialist manufacturing as well as chemical and pharmaceutical development and production. Mars Food, manufacturer of Uncle Ben rice products and Dolmio sauces; Palm Paper Limited a UK based paper specialist and subsidiary of German based Papierfabrik Palm, specialising in producing newsprint and corrugated case papers; Bespak, world leader in specialist pharmaceutical and medical devices; Cooper Roller Bearings at the forefront of split roller bearing technology since 1894; and Foster Refrigerator and Williams Refrigeration - two of the worlds leading commercial refrigeration companies. The Port of Kings Lynn handles a wide range of commodities including cereals and pulses, animal feed, fertilisers, timber, bulk liquid products and steel. In association with the Regional College of West Anglia, the Anglia Ruskin University is embarking on the development a University Campus in the town. Kings Lynn also benefits from its close proximity to the University Cities of Norwich and Cambridge (both 45 minutes away) with their world renowned Academic and Research institutions. Significant growth in the retail centre, including the new Vancouver Shopping Centre, means the town is now a major shopping centre for the area. 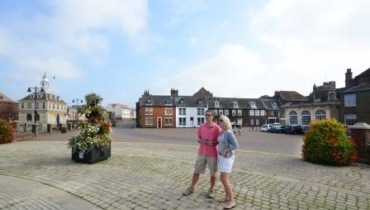 With a wide range of places to eat and drink from traditional pubs and lively bistros to quality restaurants, the town provides good facilities for both local residents and increasing numbers of visitors. Direct rail network services to London Kings Cross 1hr 40m. Easy access to the international airports at London Stansted (130K) and Norwich (75K). Kings Lynn sits at the intersection of three major road routes, the A10, A17 and A47.